It is very important to react quickly and calmly if you or someone else is having an anaphylactic reaction. It can be an extremely dangerous situation and should therefore be regarded as a medical emergency. 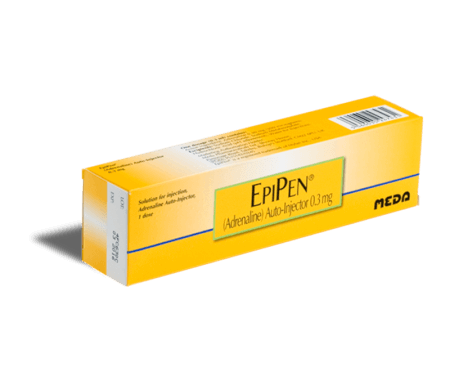 Most people who are aware of their anaphylactic risk will be prescribed an adrenaline autoinjector device, often referred to simply by the brand name EpiPen. This device should be kept with the person at all times in case of a reaction. It should only be used by persons who have been prescribed it. The pen also needs to be kept in the original container to protect it from light, which can cause the substance to deteriorate. It does not require refrigeration or freezing. EpiPen users should regularly check the expiry date and also the contents of the tube to make sure that the liquid is clear and free from solid particles. If you recognise anaphylactic symptoms in yourself or someone else who carries an EpiPen, the device should be administered without delay. Use a good grip to hold the device. Have the orange tip facing downwards, pull the activation cap off (usually blue or grey). Make sure that your fingers are not in the way of the orange needle end. EpiPen is not intended for use in small muscles and can cause problems if accidentally administered anywhere else other than the thigh. The injection should be aimed into the outer thigh. You do not need to remove clothing. Hold the device around 10cm away from the area and at a 90 degree angle. Swing the pen so that it firmly makes contact with the thigh. The device should make a clicking noise. Keep the device in contact with the thigh for 10 seconds. Do not attempt to inject the device intravenously, as this can be very dangerous. Carefully remove the device and massage the area for another 10 seconds. If there is no improvement in symptoms within five minutes then another dose of adrenaline can be administered. The body should respond rapidly to receiving adrenaline and you should see improvements soon after administration. Following on from any anaphylactic reaction you should go to hospital regardless of whether or not you required an adrenaline injection. This is so that you can be monitored to make sure that another attack does not happen. Your doctor or allergy specialist should explain to you how to use your EpiPen but if you have any doubts you should ask for a further demonstration. You will also be given the opportunity to practice with an autoinjector training device to help you gain confidence in your technique, should you ever need to use it. Intramuscular injection devices such as EpiPen have been designed so that they are easy to use. They can be administered both by the person experiencing anaphylaxis but also by other non-trained members of the public. Remain with the person and call for assistance. Make sure that someone calls 999 to request an ambulance, stating anaphylaxis as the reason. Lie the person on their back if they are feeling dizzy or faint. If they are having difficulty breathing keep them sitting up. Do not let them stand up. Hold the EpiPen device in one hand and stabilise their thigh with your spare hand so that it does not move when you apply the injection. Use the EpiPen device as soon as possible - see the instructions above. You reacted to a curry that had cashew nuts in and had quite an unpleasant reaction which caused difficulty breathing. For this reason we are giving you an adrenaline pen to carry with you all the time. This is so that if you experience another bad reaction in the future you’ve got something that will help you while the ambulance is on its way. I’m going to explain to you how to use the EpiPen. This is a real EpiPen and it contains adrenaline. We’re going to show you how to inject it into the muscle in your leg. The good news about adrenaline is that it helps all three of the serious symptoms that can happen in a bad anaphylactic reaction. Adrenaline will help all three of these problems. This is a trainer practice pen which hasn’t got any adrenaline or a needle in it and is used for practising the technique. When you hold the pen you hold it in a fist. Lots of people think they need to use their thumb but you don’t need to. The place we’re going to inject the adrenaline is in the muscle on the side of the leg. This is because there aren’t any big blood vessels there so it's a good place for it to work. Find halfway down your thigh and halfway round at a 45 degree angle. Hold it in a fist and put the Epipen in position, then take the grey safety catch off the top. The pen is ready for use. It is in the right position ready to go. With a little swing of your arm and you’ll hear a click when it hits the leg. When it goes in, count slowly up to ten then remove the pen. The real device would have a little needle that you would need to bend over so it doesn't hurt anyone. The pen would have injected adrenaline into the thigh muscle which will start to help the three symptoms mentioned earlier. I’m going to show you through the whole sequence again to remind you. Hold the pen in a fist and leave a gap next to the thigh. Take the safety cap off, then swing and come into contact with the thigh. Count up to ten and then remove the device. Using the device incorrectly could cause problems. Here’s how not to use it. I’m very anxious and I haven't been practicing properly and I don't know what to do. What have I done? I’ve injected my own thumb which is really serious. If we were to pump adrenaline into the end of my thumb it could switch off the blood supply and there’s a risk that the end of my thumb could actually die. I’m going to explain to you what you would do if you needed to use the EpiPen. I’m going to pretend that I’m giving it to your son. He has got breathing difficulties so I have him sitting down. It is really important that he does not stand up at all. If somebody stands up during an anaphylactic reaction their blood pressure can fall very suddenly. Normally if I stand up my body can control the movement and my blood pressure doesn't drop. If I’m having anaphylaxis and I stand up there is a chance that I will collapse and it can be very serious. You must be either sitting down if you have a breathing problem or lying down if you're feeling faint in which case it’s good to have the legs elevated. Hold the EpiPen in a fist and hold it over the outer aspect of his thigh. Same position, half way down, half way round. Hold it in position, leave a gap, take the safety catch off and the only thing that’s different is we stabilise the leg so that it doesn't jump away. Count up to ten, then remove the EpiPen. The reason we need to hold it in position is because it takes a while for the medicine to transfer into the muscle. EpiPen Price includes your prescription, your medicine and 24hr delivery. Can you prevent anaphylactic shock?